I don’t know about you, but I’m feeling 22… Yep, it’s pretty much mandatory to belt that song on your 22nd birthday… which is today for me, woohoo! You know what that means… cake for breakfast. Now, now, let’s not get ahead of ourselves here. I’m talking about a healthy cake. That you make in the microwave. Say what? I’ve actually been making mug cakes for breakfast for the past two years— I started back when I was first trying to lose weight. Made with a serving of oatmeal, it’s a good source of complex carbs that will give you sustained energy and keep you full all the way til lunchtime. It also provides fiber, which helps the digestive system, and protein for building muscle (not to mention helping promote healthy skin, hair and nails… am I right?). I made them a lot when I did morning workouts and needed fuel to sustain my routine. I will go ahead and say that if you don’t lead an active lifestyle, or at least squeeze in some movement the day you eat this, this breakfast can become more of a carb-bomb than a healthy energy source. But, I find eating the majority of my carbs earlier in the day better anyway, because I know I can work them off. So proceed with caution! The basics of every mug cake I make are the same: a half cup of oatmeal, half a banana, a half teaspoon of baking powder, one egg (or 1/4 cup egg whites), and a splash of vanilla extract. From there, you can add in any sorts of flavors to change it up. I’ve made a ton of different mug cakes— peanut butter, blueberry, pumpkin. It’s easy to customize them to fit your cravings. My favorite part about making mug cakes is that everything can be done in the mug, from prep to serving. I use an immersion stick blender to mix the “batter” so that I don’t have dishes piling up from transferring the mixture to and from different containers. After a minute in the microwave, you’re left with a tasty and incredibly filling morning treat that’s guilt-free and under 400 calories! 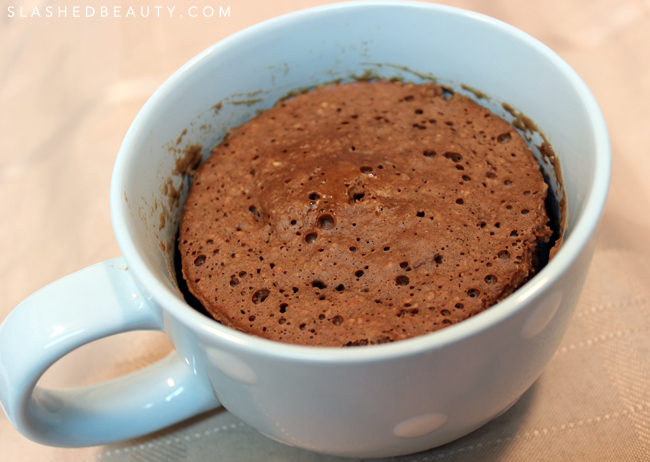 This sweet but guilt-free mug cake is a fantastic energy booster in the morning. 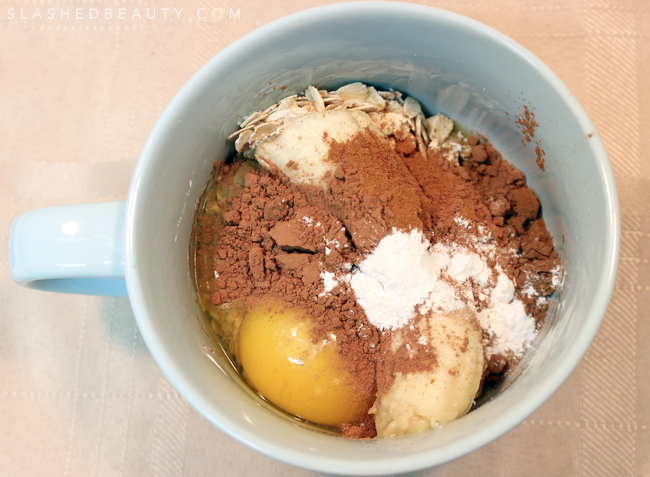 Put all ingredients into mug (or blender, if you don’t have an immersion blender). I like to layer my ingredients as dry, wet, dry, wet to help with the blending process. 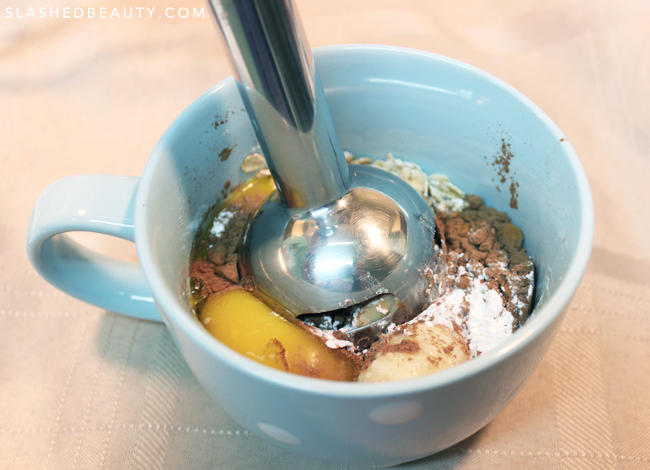 If you need to, transfer the mix into any microwave-safe mug. Microwave on high for 1 minute. After the first minute, microwave in 10 second bursts until it becomes a spongy, cake-like consistency. 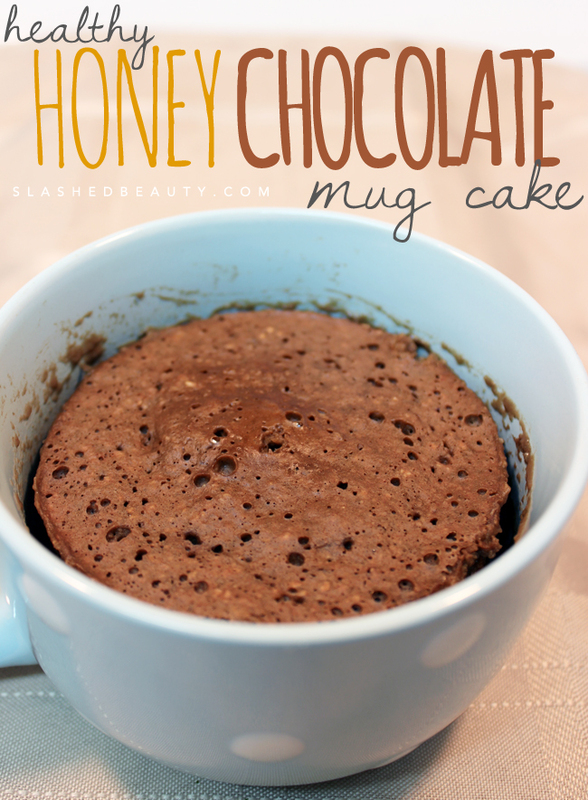 If you want to reduce the carbs in this recipe, omit the honey and add another packet of stevia to make a chocolate mug cake. Thanks so much Jamie Lynn!!! It takes all of 5 minutes! Try it!